I was recently having a conversation with a few relatives about the young girls who were involved in the recent stabbing that was inspired by the Slender Man. I had a discussion that I've had with so many people throughout my career. I really believe that these girls need to be tried as juveniles because as adolescents, they do not have the same level of decision making abilities, especially under highly emotional circumstances, as adults. They have growing and developing brains. Times of development mean that they are both more vulnerable to negative environmental factors but also more amendable to rehabilitation and treatment. This is the very reason why a separate juvenile justice system exists. The reduced capacity of minors to make decisions is the why they neither the rights or the legal responsibility of adults. The ability to decide to do something violent does not show maturity, in fact, it can often demonstrate the opposite. I worked for many years in the juvenile justice system and still do research around reducing violence among adolescents. I have always found it frustrating that there has been this collective push to treat children like adults when it comes to the law. I think in part that it violates people's sense of right and wrong that juvenile justice system tends to be much more rehabilitative than the adult system because of the reduce culpability of adolescents and the idea that they are more amendable to change. We live in a country where rehabilitation is not taken seriously and it is not seen as much as a consequence in as prison(though I will attest that for kids who commit sexual offenses, rehabilitation is much more rigorous, lengthier and comprehensive than youth detention and has much better outcomes—though I think it is much less satisfying for people on a visceral level). With the expansion of the prison state, anything but a lengthy jail sentence without any rehabilitation or treatment is not considered justice. Other countries do not punish their adolescents (or their adults) to the same extent and do not have the murder rates of the United States so I am not sure why we can't conceptualize a world where we actually privilege rehabilitation over punishment. I am not sure why we cannot imagine justice for victims without lengthy prison sentences as if there are no other viable options. Even more so, the shifting of children to the adult court increasingly has been shown to have no benefits in reducing crime and violence. It is not a deterrence for children to commit crime, nor is it likely to reduce the recidivism of children who are already system involved. The basis of shifting serious offenses to the adult court started in 1978 in New York City, as a response to public outrage over the light sentences that adolescents were receiving for violent crimes. Hugh Carey, the Governor at the time, signed the Crime Package Bill, which gave New York the toughest juvenile justice laws in the country, including for the first time, giving prosecutors the option of trying a class of violent crimes in the adult system. This is not the first time that the system has shifted in response to public outrage rather than any research that shows that it would be an effective policy change. Since that time, there is a legal mechanism to try kids as adults in every state. 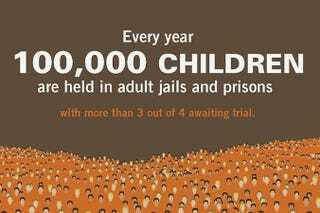 Until mandatory lifelong sentences for children were ruled to be unconstitutional, 3000 children were sentenced to lifelong prison sentences, including children as young as 13. 14 states have no minimum age to try children as adults—resulting in children as young as eight being tried as adults. Eight. This is what happens when you begin to ignore individual circumstance of each defendant. There is no underlying theoretical basis to deciding the culpability of each defendant. It becomes about a few factors, including the idea of premeditation, which itself says very little about someone's ability to make a rational decisions or show proper adult judgement. It also says nothing about someone's ability to be rehabilitated, all of which are supposed to be considered when someone is sentenced. Children and adolescents will now be allowed to participate in separate hearings that take into account their life circumstances, their amendability to change and decision making capabilities. In the Supreme Court's judgement of the constitutional ban on mandatory life sentences, they wrote: [because of] "children's diminished culpability, and heightened capacity for change, we think appropriate occasions for sentencing juveniles to this harshest possible penalty will be uncommon." I mean, this is not perfect, but it's a start and even more so, this ruling should lead people to wonder whether because of their "diminished culpability," they should ever be tried as adults because the reasons to strike down mandatory life sentence laws certainly puts the entire practice of trying children as adults into question. It'll be telling whether these young girls will be tried as adults because of the high profile nature of the stabbings. Regardless of their individual circumstances, we will continue to have a system that will privilege a law and order orientation and public outrage over what is effective. And we'll imagine ourselves safer because we can send children to adult prison. Image from Open Society Foundations. Also for more information, please check out the Equal Justice Initiative.